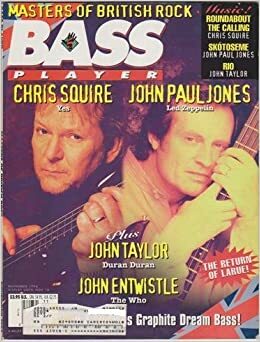 Sad that is takes Chris passing to finally (AFAIK) to get a cover shot in Bass Player. I thought he was just on there a couple of years ago? Could have been another bass magazine, but I missed out on getting one locally at the time. I recall the second on (I have it packed away somewhere), that's not a solo cover; the second one I do not recal, what issue is that? I have subscribed to BP since the beginning and don't remember that one, maybe that one got "lost in the mail"! Just went on BP's app site,and couldn't find the new Squire cover,September and October is as far as i got,though. picked up a used copy of the new one on e-bay. Pretty good article, although not much new that wasn't out there already. I did think it was fitting to end the article with comments by John Anderson!